Sweet and aromatic, similar to juniper (which makes a good substitute). 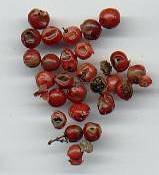 The berries are sometimes accused of causing respiratory ailment or irritation of mucous membranes. 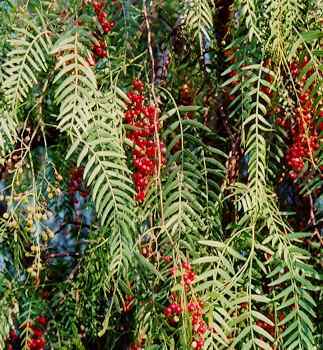 Brazil (Schinus terebinthifolius) and Peru (Schinus molle L.). 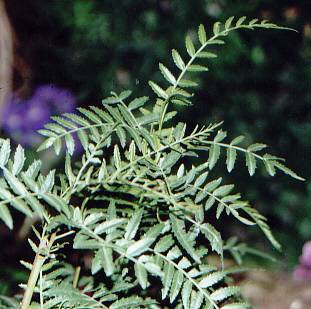 The former was introduced to Florida and today grows there wild; some sources claim that S. terebinthifolius is commonly planted as an ornamental in the countries around the Mediterranean Sea. The main producer for the European market is Réunion. 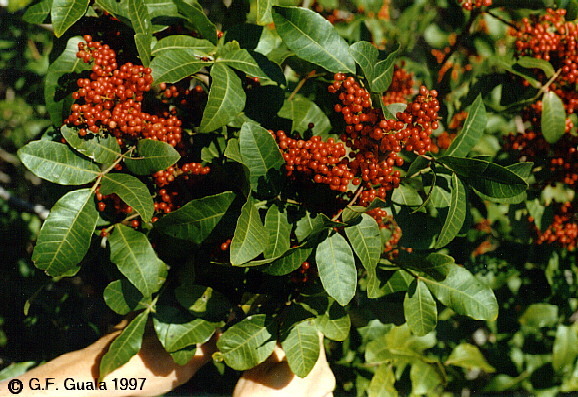 S. terebinthifolius has small fruits of peppercorn size and is sometimes used in the European nouvelle cuisine, mostly in form of a decorative mixture with white, black and green pepper corns; the larger fruits of S. molle have appeared on the European market around 1950, but are no longer available. The flavour of the small, pink berries is rather week, and so these berries serve predominantly ornamental purpose. Although some books recommend them for fish and vegetable dishes, they should be used with care because of potential health hazard.